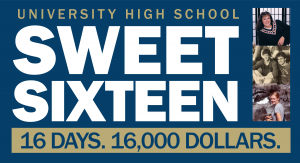 For sixteen days in March, from March 14 to 29, 2019, University High School will hold our 4th annual Sweet Sixteen Challenge. Here’s how the Sweet Sixteen Challenge works: if community members like you contribute $16,000 to The U Fund in the next 16 days, we will receive an additional $16,000 match from a generous group of anonymous donors! This is a fantastic opportunity for UHS to raise $32,000 in a very short time and to achieve our U Fund family participation goal of 85%. This year’s challenge features stories and photos of our faculty and staff, detailing the interests they cultivated as teenagers that benefit University High School students today. Even during her teenage years, place was important to Kirstin Northenscold. She lived in Minnesota and attended Wayzata High School near Minneapolis-St. Paul. 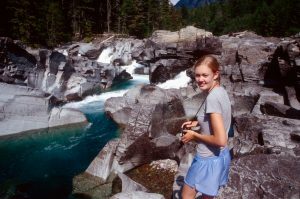 But every summer, her family would travel to Glacier National Park for two weeks of camping and hiking. “Glacier was one of the places I felt at home, even during the awkwardness of being sixteen, when nothing quite feels right,” Northenscold explained. At University High School, Northenscold shared her love of place with students in several ways, one of which was in her Literature of the American Landscape January Term class. Northenscold’s experience proves that sometimes the passions we develop in high school impact our lives, and the lives of others, for years to come. Mercedes Muñiz-Peredo was a teenager living in Mexico City when she got the opportunity to be an exchange student. Youth for Understanding, the same organization that has brought University High School exchange students from Norway, brought Muñiz-Peredo to theUnited States to live and learn for a year. She loved her host family, and they keep in touch to this day. 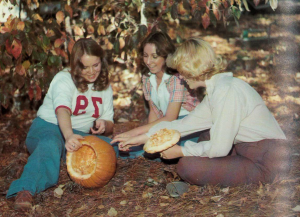 Some of the most memorable experiences Muñiz-Peredo had were the uniquely American ones – like carving pumpkins. Muñiz-Peredo’s experience proves that, sometimes, the experiences we have in high school impact our lives, and the lives of others, for years to come. Chris Bradley’s philosophy of education and view of community were shaped in large part during his teenage years at The Roeper School in Michigan. “The idea that a school can be a true community, a gathering of people with shared interests and values, a place where they can work together, often in a non-hierarchal way, was planted in me at Roeper,” explained Mr. Bradley. School government was an activity in which he experienced this idea first-hand. 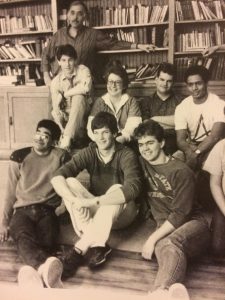 As a senior at Roeper, Mr. Bradley served alongside his peers and teachers – it was called school government, not student government, because teachers were equal members – in the government. There were no titles, like class president or vice president, to this group because a hierarchy would run counter to the values of the school, and the goals of the group were simply to work together and better the school. Mr. Bradley’s experience proves that, sometimes, the passions we develop in high school impact our lives, and the lives of others, for years to come. 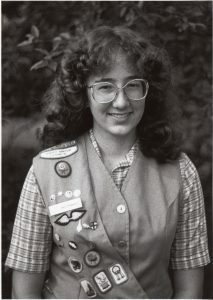 It was her journey through Girl Scouts and her time in high school that strengthened Carolyn Bradley’s love of the outdoors and sparked her interest in studying biology. Looking back, they also planted the seed for her future career. “Working at University High School has allowed me to continue doing these things, and it has given me a great group of students that I can encourage to do the same,” she added. As Mrs. Bradley’s experience proves, sometimes the passions we develop in high school impact our lives, and the lives of others, for years to come. Marching band is where the teenage Daniel Knox found his community at Iredell High School (NC). He knew the buildings of the school thanks to a summer band camp. He ate with his bandmates thanks to band class falling during the school’s lunch period. And he learned from a band director who valued inclusivity and openness over harshness and perfection. 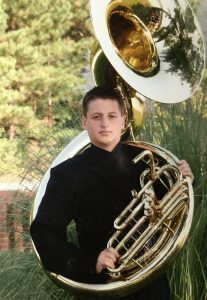 Knox credits this experience in high school marching band – he played the sousaphone and tuba – as one reason he studied music education in college. And today, as a music instructor at University High School, he sees some of his band director’s influence shine through in his own teaching. Knox’s experience proves that, sometimes, the passions we develop in high school impact our lives, and the lives of others, for years to come. Collin Lawrence knows the impact a good coach can have on high school athletes. His coach, York High School’s Joe Newton, was one of the greats. 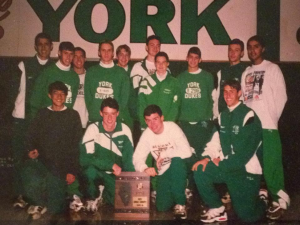 “My knowledge of running and my philosophy of coaching are deeply indebted to the time I spent running at York High School (IL) under legendary cross country coach Joe Newton,” said Lawrence. Lawrence has coached University High School’s track team since 2015, but this fall, he had the opportunity to share what he learned from Newton as the Trailblazers’ head cross country coach. Lawrence is proof that, sometimes, the passions we develop in high school impact our lives, and the lives of others, for years to come. It was a Spanish teacher who encouraged a teenage Jill Woerner to get a pen pal. Woerner paid $1, answered some questions, and hoped to be matched with a pen pal in Spain. Instead, she was matched with eight – two students in Spain, two in Hong Kong, and one each in Venezuela, Australia, France, and Germany. 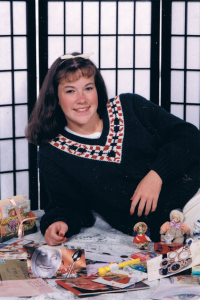 Today, Woerner still writes to three of those original pen pals – she often does her writing on international flights – and she implemented a pen pal program for students in her classes this year. Spanish 1 students write to the Bolivian children Woerner met through Niños con Valor in June. Spanish 2 and AP Spanish students write to high school students in Spain. Woerner’s story is proof that, sometimes, the passions we develop in high school impact our lives, and the lives of others, for years to come.